The Partners for a Drug-Free Milford Miami Township shared the :30 commercial addressing prescription drug use their students created and that will air this spring on local cable. Stacy Mathis, director of the program, also talked about the free forum on opiate abuse to be held Thursday, March 6, 6:30-8 pm at Wyler Automotive Family on Milford Parkway. It’s extremely important for the public to understand what is happening with opiates, especially since they can be the gateway for even more dangerous drugs such as heroin. Gwen Walden from the Kiwanis Club of Milford recognized Dr. Bob Farrell, Milford’s superintendent, for his support of the club and also of Key Club in the high school. Due to Dr. Farrell’s encouragement, Key Club was reinstated several years ago and has been highly successful. The district’s finances are on track and will be reviewed in more detail in the next few months. Under the new state funding formula, we will receive more funding than ever before for our preschool program, which is required by state law for special needs students. We had projected to receive appr. $90,000 this year, and we will actually receive just over $400,000. Work on the two new schools, Seipelt and Boyd, continues. There has been much discussion about land usage, which is a concern on the Boyd E. Smith site. Although there is quite a bit of land on that site, not much of it is usable without incurring major expense. Because of this, the architect is looking at a two-story building that will fit on the available space. We will likely use the same design at both sites for efficiency, which means the Seipelt building will likely be two stories no matter which site is used. The design committee is also looking at how best to use the 53,000 sq. ft. in each building. There will be three classrooms built for each grade, and a vibrant media center will be a focus. Finally, the Ownership Program of Requirements looks at ongoing cost and management of buildings, ensuring utilities, HVAC, storm water, etc, will all be handled effectively not just when the buildings are built, but 5, 20 and 50 years down the road (based on what we know today). This post has nothing to do with the Milford school district; so why am I posting it? We have recently faced severe – and very scary – health problems with our daughter. For months, we had no idea what was going on. In fact, for years before that, strange symptoms were discounted as “normal” or “overexaggerated.” Yet it turned out she is suffering from heavy metal toxicity, specifically from lead. It had gotten to the point where she could not function normally and she was getting worse, quickly. A few years ago, the Milford school district revised our math curriculum to meet new standards. Dr. Jill Chin shared an overview of the program and the results our students are achieving with this new curriculum. If you would like to review the entire Power Point presented by Dr. Chin, please click here: Math Program Update Feb. 20, 2014. The district will be holding four important meetings in upcoming weeks. Two of these will be community forums, designed specifically to gather input and feedback from community members; one will be a board work session, which is an informal meeting of the board. It will also have a place for community members to share comments, but that is not the focus of the meeting. The fourth meeting is the Business Advisory Council regular meeting, where the Council will be discussing issues re: Milford Main. This meeting is open to the public, but there will be no public participation. Flight Night is almost here! If you haven’t attended the Milford Athletic Boosters’ Flight Night event, it’s a fun and inspiring event. This year’s featured speaker, Rocky Bleier, is a four-time Super Bowl champion from the Pittsburgh Steelers. 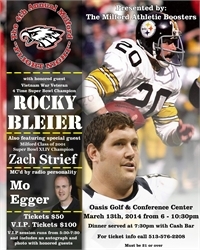 Milford’s own Zach Strief, a 2001 graduate and one-time Super Bowl champion from the New Orleans Saints, will be the introductory speaker. Tickets are $50, with VIP tickets (includes cocktail reception, autograph session and photo opportunity) at $100. Tickets are available by calling the Milford Athletics office at 513/576-2208. Spring is just about here (hurray! ), and we all need mulch to get our yards up to par. Why not purchase from the Milford Band Boosters – you’ll get a great price, FREE delivery, and be helping Milford’s own award-winning band! Simply print out this flyer – MILFORD BAND BOOSTERS ANNUAL MULCH SALE 2014 – and send it in by March 14; mulch will be delivered (or you can pick it up) on April 14. Student Council is sponsoring Faces without Places starting next week. It is an organization that collects school supplies (pencils, pens, book bags) for homeless children and those who can’t afford supplies. They’ll be collecting items over the next 4 weeks and the class with the most donations will receive donuts and juice. MMT Drug-Free Coalition Ski Club has come to an end and a new session of activities for high school and Jr. High students to get involved has begun. Plans are underway to offer Archery in the Spring. Come out and support our students! It’s always a great time to be an Eagle! As the Eagles Winter Season winds down, the postseason has seen some impressive results! Spring Sports have been conditioning as teams prepare for the upcoming season.